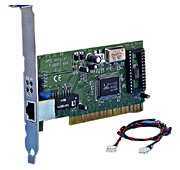 The NIC-100T Ethernet Adapter is a 32-bit Ethernet network interface adapter for PIC local bus compliant PCs. It combines two common types of Ethernet cabling interface �C a RJ-45 connector for unshielded twisted pair cabling (UTP/STP), and a BNC connector for thin Ethernet connection. Extensive driver support for commonly used network operating systems is available, and makes NIC-100T and NIC-101T more versatile. The NIC-H110T is a Fast Ethernet adapter ideal for mass data transmission. It is easy to install, easy to operate and good for multimedia environment. NIC-110T’s single RJ-45 port will detect the 10Mbps or 100Mbps automatically. NIC-H110T supports PCI, peripheral component interchange, and Bus Mastering architecture, fully utilizes the 32-bit data bus bandwidth, and provides the best performance/price ratio. The NIC-D110R Fast Ethernet adapters are the most convenient and powerful ways for users to connect their PCs to the Fast Ethernet network. GVC Fast Ethernet adapters provide exceptional performance, a rich set of features and functions, and outstanding value for desktop systems. NIC-D110R single chip solution is suitable for those with limited budget but need to connect the client PCs to Fast Ethernet network for mass data transmissions. NIC-D110R adapters are designed with auto-negotiation capability that can adjust the speed to 10Mbps or 100Mbps, half or full duplex automatically. Most of all, NIC-D110R also supports the latest specification - Advanced Configuration Power Interface (ACPI) and WakeOnLAN for remote PC management. ACPI supports low power sleep states to reduce power consumption, while allowing a PC to be awakened for remote management. WakeOnLAN function is able to wake up a "sleeping" PC over the network for remote, off-hours maintenance.